Saving the World One Nail at a Time: Julep NYC Pop Up! You may know already that I am a big Julep fan (it may have something to do with my monthly Julep Maven reviews)! So you can imagine how excited I was to learn Julep was opening a pop up shop for just over a week from December 13th to December 22nd. I hope that it's a success so they can travel to more cities around the country. On the 12th I was able to attend a launch party exclusive to mavens! It was an amazing experience I can't wait to share with you. This amazing Julep bottle pouring polish will be there to greet you when you walk into the store! 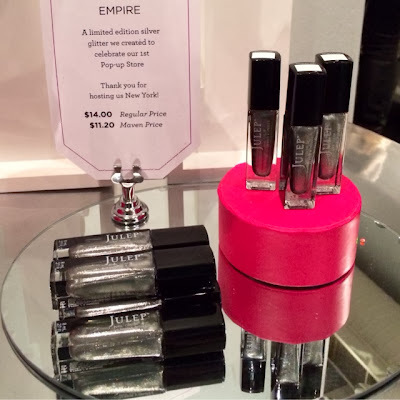 The shade looks like Empire, Juleps exclusive shade only sold at the pop up shop. 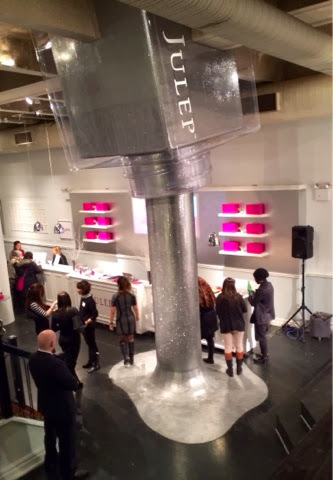 The Julep pop up shop is located at 102 5th avenue between 15th and 16th street. The party began at six and went until eight. I almost stayed the entire time! The first station I stopped by was the testing station! You can swatch to your content and pick up shades that catch your fancy. Another station is the build your own dream box! Only until the 22nd you can stop by and create your own maven box. Instead of paying for each item individually you'll only pay $19.99. You can get two polishes and a product, three polishes or two products as a duo in your box. 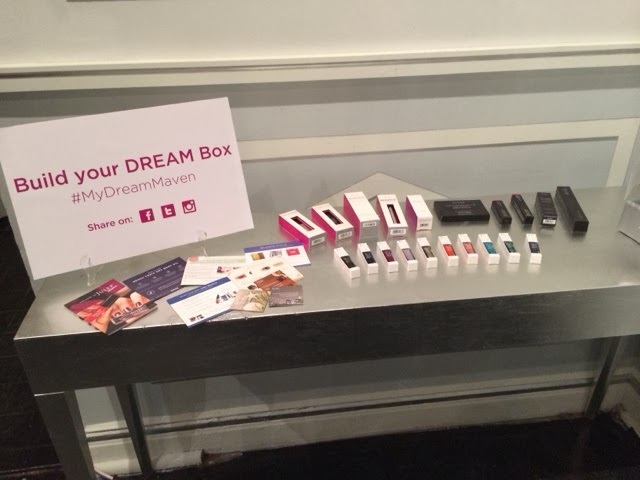 My friend Rachel picked up two polishes and the Oxygen Nail Treatment as her product to make her dream box. There are products, different stations and adorable layouts everywhere! 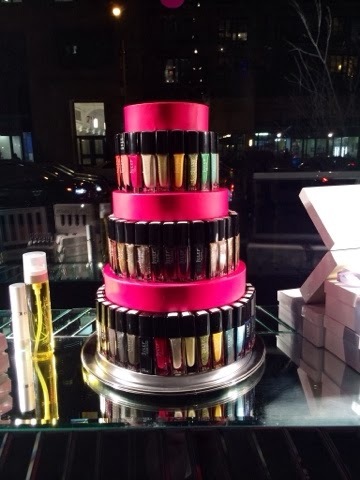 This Julep polish carousel is in the store window. All of Juleps holiday items are in stock for gift giving at the store. If you've got a polish lover on your list who you haven't picked up a gift for yet, stop by here. 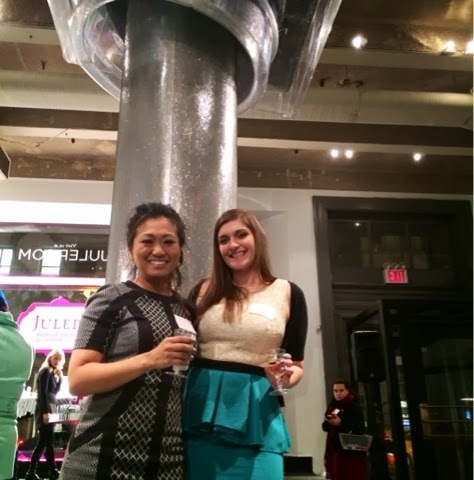 At the party I was lucky enough to meet Jane Park, founder and CEO of Julep! We talked all things nails. She wants to know what us mavens would like to see from Julep for products or shades in the future. Let me know if you have any ideas in the comments. At the party Jane spoke about Julep, we were treated to wine and nibbles and of course I shopped! Julep has designed this exclusive shade, Empire, for the pop up shop. It is a beautiful full coverage silver metallic. Definitely pick one of these up if you get to stop by. If you won't be in New York, make your friends get you one! You won't regret it and you won't be able to get it anywhere else. There are so many more fun stations and things to see at the Julep NYC Pop Up, but you'll have to head there and check it out for yourself to see it all. Here is my haul from the event! I had to grab a Julep iphone 5 case that reads 'keep it colorful'. The baggie was a gift for attending, thank you Julep! The baggie included Juleps Rock Star Hand Cream in a mini size, the exclusive NYC Julep Empire shade, Julep Oxygen Nail Treatment, three One-Step Polish Remover Pads and of course the reusable Julep toiletry bag. Empire may be my most favorite Julep shade I've ever seen. This polish has full coverage in one stroke, I used two just for good measure. This is a very fine glitter that gives a foil-like effect. Empire even picked up colors in reflection! The slight pink you can see is my Julep cell phone case while I'm taking the shot. Should you be lucky enough to be by lower 5th avenue, you have no excuse! Check out the pop up shop while it's here. If you aren't already a maven you can sign up to get a monthly box of polish and products for $19.99 each month by going here and taking the Julep style quiz. If you're a maven you'll get reduced prices on everything in the store. Check out my previous Julep box reviews here on the blog to see what they're like for yourself. 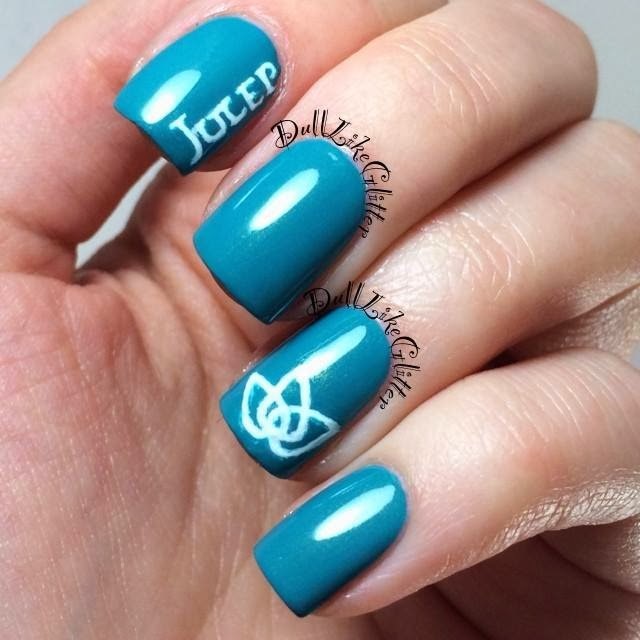 Will you be stopping by Juleps NYC Pop Up? 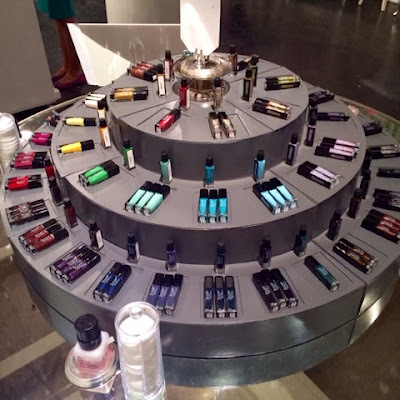 What products and shades would you like to see from Julep in the future? Haha, I see myself in that overhead pic ;) Great swatch! Kelli, that's awesome! I've started following you blog. I envy you having a julep store by you! My IG name is sarahemanis.